This article will describe extending and reducing LVM volume and ext4 filesystem. 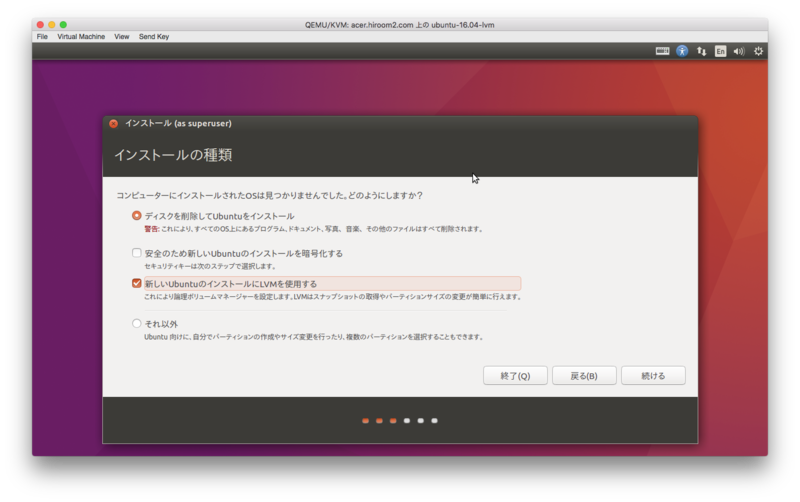 Install Ubuntu 16.04 with LVM. Ubuntu 16.04 with LVM have boot delay problem, you can fix this problem with this solution. Do below process with running Ubuntu 16.04 installed at storage. Create physical volume with pvcreate. Append /dev/vdb1 to ubuntu-vg with vgextend. pvdisplay display list of physical volume. /dev/vdb1 is used by ubuntu-vg. dm-0 is extended by the amount of /dev/vdb1. Filesystem size is as below before extending. Extend filesystem with resize2fs without umount. Filesystem size is as below after extending. Reducing ext4 filesystem needs to umount. 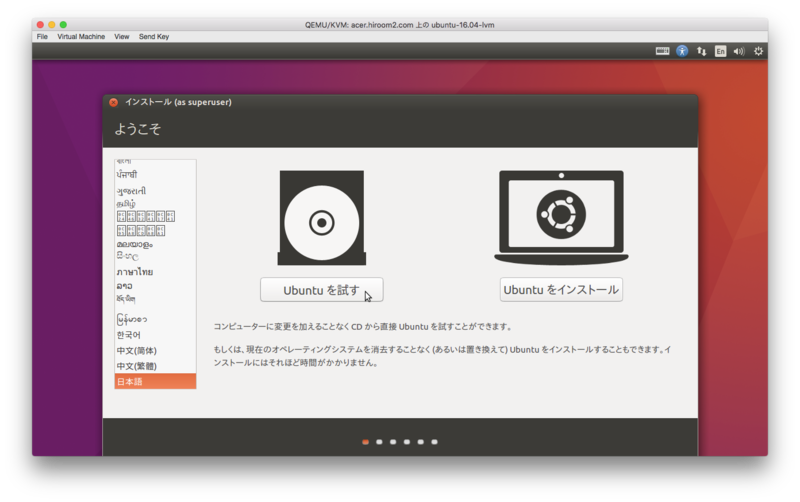 In this case, run LiveDVD Ubuntu 16.04. And remain size must be larger than reducing size. Boot LiveDVD and select "Try Ubuntu". Reduce size must be larger than physical volume size. Check physical volume size with pvdisplay. Reduce size should be 4MiB x 20479 = 81916MiB. Reduce ext4 filesystem and logical volume at once with lvreduce -r option. extents) to 78.52 GiB (20101 extents). Move data in /dev/vdb1 to /dev/vda5 with pvmove. In this case, there is no data in /dev/vdb1. No free extents on physical volume "/dev/vda5". Remove /dev/vdb1 from ubuntu-vg with vgreduce. Removed "/dev/vdb1" from volume group "ubuntu-vg"
pvdisplay does not display /dev/vdb1. Shutdown LiveDVD and boot Ubuntu 16.04 installed at storage. Filesystem size is reduced.